offroadTB.com • View topic - Review my Build Plans? My plan is to do a 2-2.5" inch lift on my 07 Trailblazer with 240,000 miles. Heres what I have so far from researching. BDS'S Suspension Lift or Liftmeister 2.5"
Now my questions for this is, if I do the Z71 Suspension for the rear, say I go for Liftmeister 2.5" lift setup, do I need to put the lift spacer/block in the rear with the Z71 or does the Z71 lift the truck up itself matching with the front height? Also, where would I purchase the Z71 Suspension? Rims: stock for now, will upgrade later down the line. will keep 17-inch size. How does this all look? Anything I'm missing or not understanding? I would like to have more appearance aspect to the truck by not doing any crazy lift or tires. I'm inspiring my build a lot from snowblazer. Re: Review my Build Plans? Also don’t forget the armor oil skid plate and radiator skid plate. see our MDB fab in our vendor section. Lift block + springs in the rear. It may feel high in the rear at first, but the Z71 springs do settle. If you don't like it, its not that difficult to take the lift blocks back out - not like the front. Trail X wrote: Lift block + springs in the rear. It may feel high in the rear at first, but the Z71 springs do settle. If you don't like it, its not that difficult to take the lift blocks back out - not like the front. Will having the Z71 springs + the 2.5-inch block make the truck sit unevenly with 2.5" in the front? The trucks are already nosedived a little straight from the factory, but yes, Z71s will add like another 2 inches on top of the lift block. Like JD said, if you decide you can't handle it after they settle down you can always pop the spacers out real quick. Easy, just jack it up until the axle hangs and maybe take out shock bolts if you have to. I have Z71s and 2" blocks in the back and '87s with 3" blocks in the front, and if I took my winch bumper off the front it would probably sit darn near level. 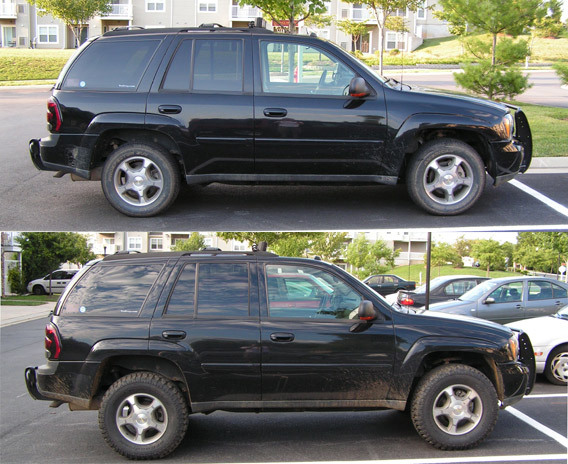 This is a comparison between a stock truck and a 2" BDS lift (front and rear), Z71 rear springs, and 32" tires. The rake isn't objectionable, even before the springs settle. Now my questions for this is, if I do the Z71 Suspension for the rear, say I go for Liftmeister 2.5" lift setup, do I need to put the lift spacer/block in the rear with the Z71 or does the Z71 lift the truck up itself matching with the front height?. with the Z71 springs and let's just use Skyjacker N8030s for example, that would give a 2.5" total lift in the rear right, so you wouldn't need a lift block if 2.5" is the lift you want? So all you would need to level would be a 2.5" level block in the front, is that correct? You can tell I have never done this before, complete Noob. Z71 spring only lift about 1.5"
but isn't there already an inch difference from the back to the front stock? So if you take that stock 1" and add the spring 1.5", that's where I'm stuck. There is an inch difference in rear height to the front though right? Sounds about right. If you need more, you can always add more. The rear is fairly quick to add to once you've done it. Trail X wrote: Sounds about right. If you need more, you can always add more. The rear is fairly quick to add to once you've done it. Thank you for the solid reply, I appreciate it. So I'm just going to do a 2.5" lift block on the front, new shocks and Tahoe springs on the rear. That would make me high enough to run a set of BFG Mud-Terrain T/A KM LT255/75R17 right? Thank you for the solid yes or no answer, that's what I've been waiting to hear. Everyone has a bunch of different combinations of builds, but I don't think I've read any that are exactly like what I want to do. Suspension wise, yes. Just be sure you're also doing something about the backspacing. You can only go up to a 30.5" diameter tire unless you do something to reduce the backspacing. Trial X. when you say you have to have backspacing if you go above 30.5 tires. Are you saying the height will hit the upper ball joint or is the real need is to have at least 1-1/2 inch spacers to get the tire away from the inner fender wells so when you turn you would minimize rubbing and cutting? I’m getting ready to buy -12 wheels with 285 70 17 tires. I think I have this calculate I will have a 1/4 to 3/8 verticle measurements away from tire and upper ball joint. I have a 2 inch front only BDS LIFT which in reality it only lifted it 1.5 inches. I have fished around the site for some time. I hope I can get some rock solids answers. I currently have 50mm offset stock wheels. After my 2 inch BDS front lift which in reality was 1.5. My ball jiont is one inch higher than my tire and one inch overlapping the tire. I want 285 70 17 tires and 17x9 wheels. Stock wheels are 7 wide. I have use a couple tire calculators. Is there anybody running offsets of -12 to get the clearance? If so what is space between the tire and the ball joint. I see a lot of TBers with the 1.5 spacer and stock wheels. I want to eliminate the spacers. 50mm is about 2inch offset to get back to zero. So if Buy -12 Im at 2.5. If the math dictates I go 1-1/2 inch wide to miss the ball joint. What do i really need with 285-75 17 tires. What is killing me wheel selection. I’m really just interest in —12 wheel tbers. Last edited by Trail X on Tue Jan 30, 2018 11:36 am, edited 1 time in total. Its to miss the upper ball joint. Less backspacing actually makes interference with the fender wells worse, but it does help with interference with the frame rails. Its a tight rope. If you get it right, you can have 33" tires that haven't required cutting of the fenders, don't hit the upper ball joint, and don't rub the frame, but its a squeese. Trail X wrote: Its to miss the upper ball joint. Less backspacing actually makes interference with the fender wells worse, but it does help with interference with the frame rails. Its a tight rope. If you get it right, you can have 33" tires that haven't required cutting of the fenders, don't hit the upper ball joint, and don't rub the frame, but its a squeese. Well I bought Moto Metal wheels blanks from Custom offset, they are going to drill them. The Moto Metals are -12 17x9 backspacing 4.5. My stock are 17x7 with 6 inch back spacing +51mm, so if my math is correct this will give me the 1 1/2 inch needed to get around the knuckle. I went with 285/70-17 BF Goodrich tires also. So I’m going all the way. These Tires and wheels move the stock outside side wall out 2 7/8 inches.